A new trend is opening up a new market for a few Napa Valley wineries: Wine in kegs. The Kitchen Door restaurant that opened this week in the Oxbow Public Market, is only the latest local eatery adopting a very old idea: Serving from a keg. In the old days, of course, it was from a wood — barrel, but drawing wine from a barrel — even a small one — leads to oxidation and worse. Now, restaurants mostly use small 20-liter stainless steel containers similar to those used for soda syrup — sometimes beer kegs — and the wine is both protected and propelled by a neutral gas like nitrogen or argon (not carbon dioxide like sodas, as that would carbonate it). In other parts of the U.S., it’s been common to see casual restaurants selling wine from 20-liter boxes, big brothers to those sold in supermarkets. That’s been rare in wine country, however, partly because the wine is typically low end. However, a number of restaurants in Napa Valley have dispensed wine from kegs, including are Farmstead, Fish Story, Cuvée, Silverado Brewing Co., Hurley’s and the restaurant at the Culinary Institute. Oxbow Wine Merchant once offered tap wine, but switched because of demand for craft beer. Many restaurants in the Bay Area have jumped on the bandwagon, too. 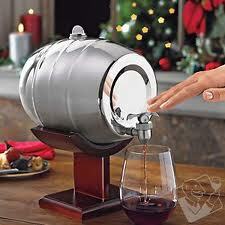 A few companies have sprung up to supply the demand, though filling the kegs can be done at a winery.